One of my favorite classes to teach at the gym is boot camp. There are so many different ways to do it and many of the exercises can be done without any equipment so people learn that they can exercise anywhere...at home, while staying in a hotel, in the park. There's often a look of surprise when new students see me for the first time. I don't exactly look like a typical fitness instructor. I'm really short and although I'm pretty strong, I'm not thin and don't look muscular. And I'm very self-conscious about not looking the part. Yesterday I went to a free offering of boot camp at a gym nearby. 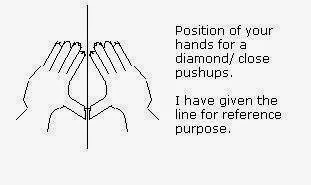 One of the exercises in the circuit was diamond pushups; so called due to the hand placement which makes a diamond shape. These work the little triceps muscles on the back of the arms (the ones hidden by our "bat wings" or "granny arms"). This muscle is small and that makes these pushups harder to do. I've always had a relatively strong upper body. In elementary school I'd not only climb the rope to the top of the gym but I'd do it repeatedly until the gym teacher made me stop. I have large-ish shoulders (not linebacker large but big for a tiny girl) and can pound out quite a few pushups...on my toes. Remember when girls did pushups on their knees and boys on their toes? Yeah, not me. I do them on my toes and always have. In 10th grade or so I did more pushups than any other girl in my grade. The gym teacher didn't believe I did that many (we were working in pairs and counting for each other) and made me do them again. A boot camp instructor I had overseas used to say, "Good, you're doing them boy-style," and I'd reply, "No, I'm doing them girl-style!" So yesterday, in this boot camp class I was doing diamond pushups on my toes (okay, to be honest, I can't do as many of those as I can regular, wide-arm pushups but I can still do them) and the instructor saw me and said, "Look at you doing them on your toes!" Of course, she did not know that I'm also an instructor and, not looking the part, I can understand why she would be surprised. My blogger-friend Angie posted just the other day about body image and not meeting image standards (check it out, it's a great piece...and if there was a poster of me on the door to the gym I'd go into hiding so good for her getting past it!). It's not easy. I know I'm strong and fit even if I don't look it. But that doesn't stop me from wondering if people don't come to my class because they feel like they will get less of a workout from an instructor who doesn't look like she lives at the gym. I worry about not looking "good enough" to be an instructor even if I can out-pushup the guys in the class. I want to be satisfied being strong and fit but I'm not sure how to get there mentally. How do you feel about body image or about what expectations you have from fitness instructors? Have you overcome body image issues? How many triceps pushups can you do (on your knees or toes)? Challenge yourself! I love that you are exploring this topic! I am so annoyed that the instructor said that to you! That's really perpetrating this stereotype that we are trying so hard to break! That's really too bad that she has not explored this herself. Even if you were a beginner and inexperienced, that was still a pretty rude thing to say. Sometimes we hear what we want to hear and sometimes we hear what we expect. I expected her to be surprised so perhaps that's why she sounded surprised to me. I want to think that she was trying to encourage me. On the other hand, part of me likes surprising people with what I can do. I like breaking the stereotype! I hope we continue to explore this topic together! I'm looking into yoga training...YIKES!! I am happy you still blog. From time to time I read your adventures. I wish you great happiness. Know you are still thought of and missed.